My new obsession is Blue Moon Acres microgreens. Not only are they stunning to look at, but they are at the top of my list of the freshest fare. These tiny delicate greens have an amazing texture… a tender crunchiness. Although they are delicious on their own, I love to make salads with all the ingredients diced small to mirror their miniature size. They are particularly tasty with sweet fresh tomatoes, diced cucumbers and red peppers, shelled edamame or other beans. Add a little crumbled feta or blue cheese and you have an amazing dinner. 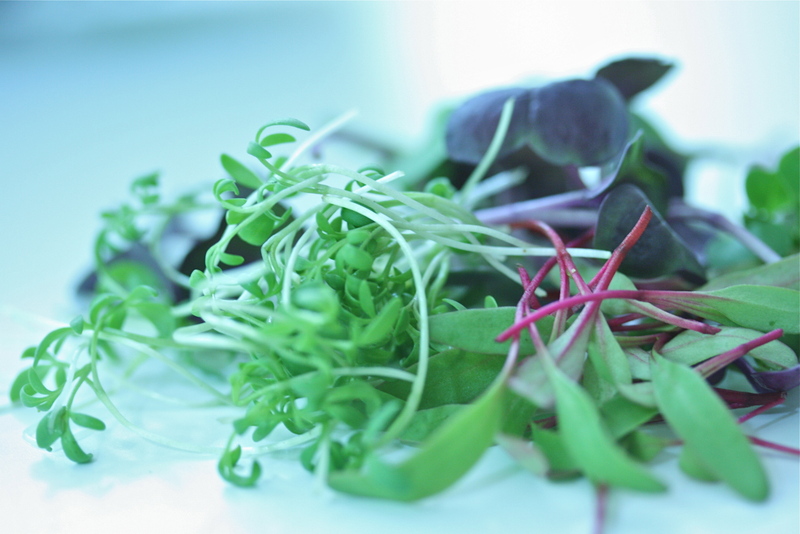 Microgreens are very flavorful on their own. Dress them lightly so their flavor is the star. Last week I tried Blue Moon’s arugula for the first time. I don’t know that I’ve ever taste arugula fresh from the farm. It was super peppery, and now I realize it tasted the way arugula should taste. I know I’m beginning to sound like a broken record, and the farm season is just kicking into gear, but I am amazed by how incredibly delicious the just picked farm produce continues to be. It’s a “feel good” moment when I can bring dinner to the table for our family, knowing the ingredients were in the earth just hours before. Support your local farmers and shop local! This beautiful smoked salmon platter worked perfectly as a first course for a family dinner. It would be lovely for brunch or as a light lunch, too. To make the dressing, place the lemon juice, Champagne vinegar, garlic, mustard, sugar, fresh thyme, salt and pepper in a small bowl. Whisk in the grapeseed oil to emulsify. Lay the slices of smoked salmon around the edge of a platter. In a large bowl, toss the microgreens lightly with the mustard dressing. Mound the microgreens in the center of the salmon. 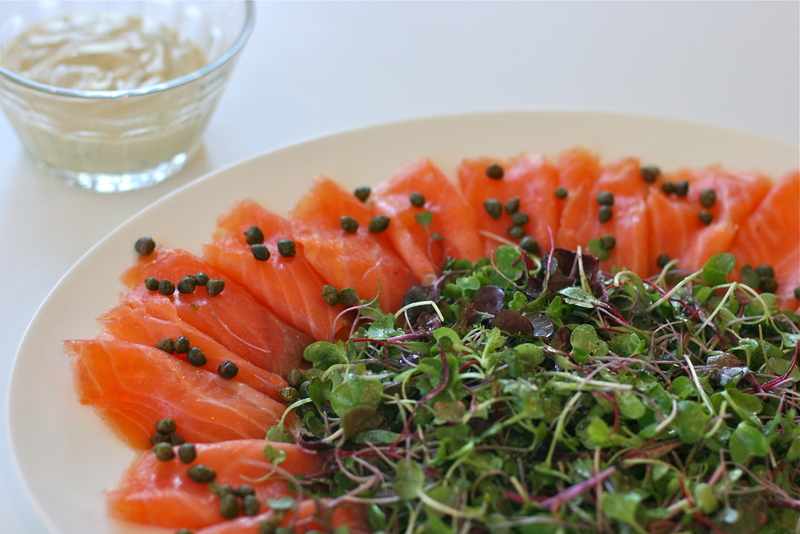 Sprinkle the capers over the salmon and serve with the remaining Champagne mustard dressing on the side. This dish allowed me to combine just picked asparagus from None Such Farms with fresh picked arugula from Blue Moon Acres. Two farms, just minutes down the road from each other. Talk about eating local! This salad was bursting with freshness. Toss the asparagus on a small sheet pan with a little olive oil and Kosher salt. Roast in the preheated oven until bright green and still crisp tender – about 10 minutes. Remove from the oven. 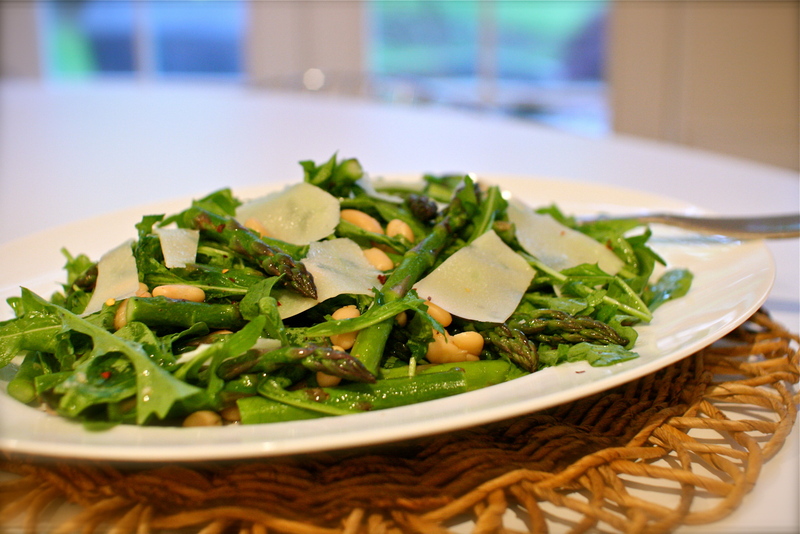 Combine the warm asparagus with the fresh arugula and beans on a platter. Sprinkle everything with salt and pepper to taste, a pinch of red pepper (if using), juice of 1/2 lemon and a healthy drizzle of olive oil. Toss together so everything is coated. Top with shaved fresh parmesan and serve. So beautiful they last a long time because they are so fresh !